What a wonderful day! After such a busy week, it was wonderful to have a whole day spent with family and friends to celebrate the arrival of our little Joel! It was a fabulous baby shower thrown my by awesome parents, with the help of my sister, Jean and brother, John. Louis and I are so truly blessed with having my family in our lives. They have done so much for us and we love how excited and involved they are in our pregnancy. It will be so sad knowing my parents will be leaving for Philippines soon, but after today, I realize how many people will still be nearby to reach out to if needed. The shower was held at a local restaurant up in the far north suburbs of Chicago. With nearly 80 guests attending, it certainly was a day full of hugs, kisses, belly rubs and smiles. So many long time family and friends attended, it just felt so good to be "home." 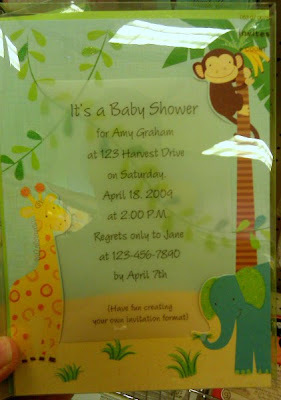 For the party room, we went along with the same jungle theme and colors to match the invitations my sister made earlier. After knowing what decor my mom purchased for the party, I wanted to contribute somehow and offered to make the cake and edible favors. Using the decor as inspiration, I made the three tiered shower cake for the party. The cake was a marbled dark chocolate and yellow butter cake. I also made a french vanilla pastry cream as the cake filling. Rather than using buttercream, I made a homemade marshmallow fondant with a hint of orange extract. It was absolutely the *best* fondant I've ever had and also the easiest to make and work with! I'll be posting the recipe for the fondant on my food blog soon! For the edible favors, I wanted something easy that wasn't too time consuming. I dipped large pretzel rods in colored white chocolate to match the color scheme - yellow, orange, blue, white, green and tan. Displayed in grouped colors, it went well with the overall look and added some height to the table too. I got so many compliments on the cake and favors, it felt really good... even though I know it's been awhile since I worked with fondant and did some cake decorating. I'm sure once Joel gets here, he'll give me an excuse to keep working on my cake decorating skills and fondant work! Awwww, you look too cute!! Congratulations!! I can't wait to see the new member of this world and your family. Everything looks fantastic, Joelen! Your cake design is so cute, and I think you did a great job with the fondant. Congratulations! I love the look of the cakes and I definitely have to try flavoring my next batch of fondant with orange. It sounds delicious! Great Post.....I found your site on stumbleupon and read a few of your other posts. Keep up the good work. I just added your RSS feed to my Google News Reader. Looking forward to reading more from you down the road!